We place a high value on good links with home. Parents are able to see the Headteacher or teachers at any convenient time by contacting the school and making an appointment. Each Friday, children’s achievements are celebrated and parents are encouraged to share in this experience by coming along to a Friday Celebration Assembly at 14:30. Once a term, there is a display of work from every year group showing the results of their themed work through continuous provision: This means that a theme is explored in depth and children can participate in independent and on-going work, planned by the teacher in order to give them a really deep understanding of a subject area and the opportunity to develop associated skills. Class Assemblies are another opportunity for parents to come along and celebrate their child’s learning – dates are published on the calendar. 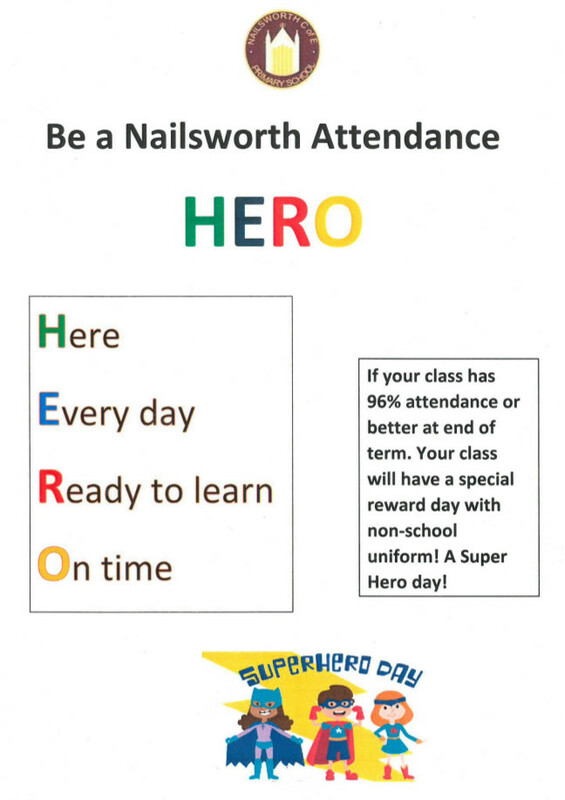 Attendance on time, every day is really important to your child’s learning. 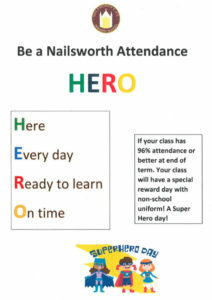 We are encouraging children to become Nailsworth Attendance HEROs. This is to support parents in encouraging students to be in school everyday, and also to ensure they are on time. If your child is late in the morning they miss crucial learning time and it is recorded as a half day absence, unless it is on medical or in exceptional circumstances. Please can you ensure you contact the school first thing in the morning to inform us if your child will be absent or late. There is an answer phone where you can leave a message. In the Summer Term, parents receive a written report with an optional follow up meeting with the teacher. The school encourages and appreciates the help of parents who come into school and assist with a variety of activities – for example, reading with children, extra curricular sports clubs support. If you would like to help, please contact the School Office and let us know. Please follow the link below to complete the Parent Survey. Your feedback is invaluable to us in knowing what we are doing right and what we can improve on. Many thanks.